WOWZER!!!! That is all I can say about this dinner! And I know my family would say the same! 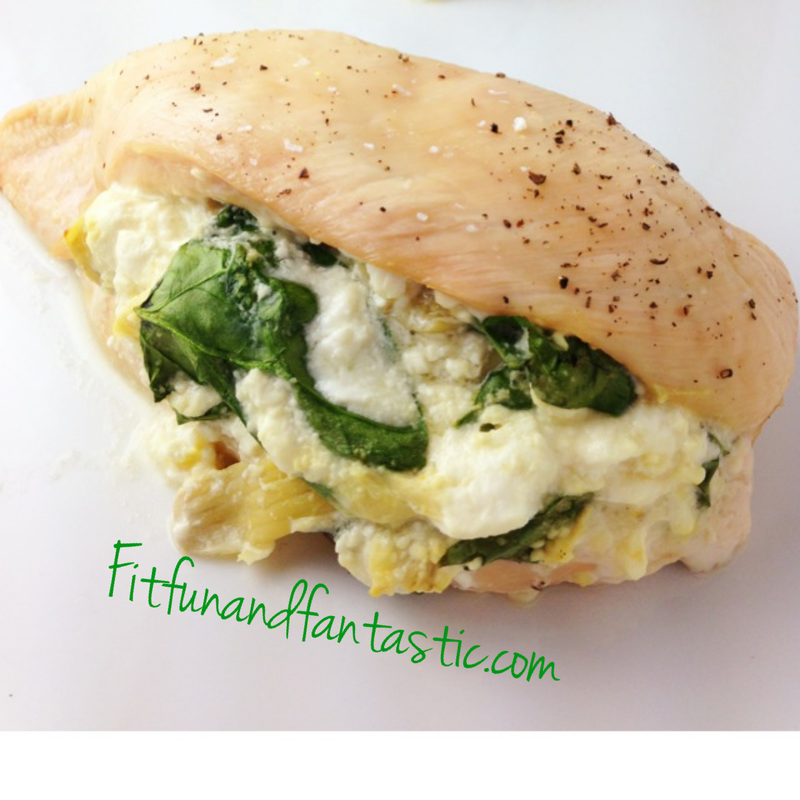 It has got all the delicious flavors of spinach artichoke dip, but healthy and in a chicken! Now that is a win! Preheat oven to 375 Fahrenheit. Spray a baking sheet with non-stick spray. Mix the cottage cheese, spinach, artichokes, garlic and nutritional yeast together. Butterfly chicken breasts then stuff the cottage cheese mixture inside the chicken breasts. Sprinkle the salt and pepper on top of the chicken breasts. Bake for about 30-40 minutes (my chicken breasts were large) or until cooked through. 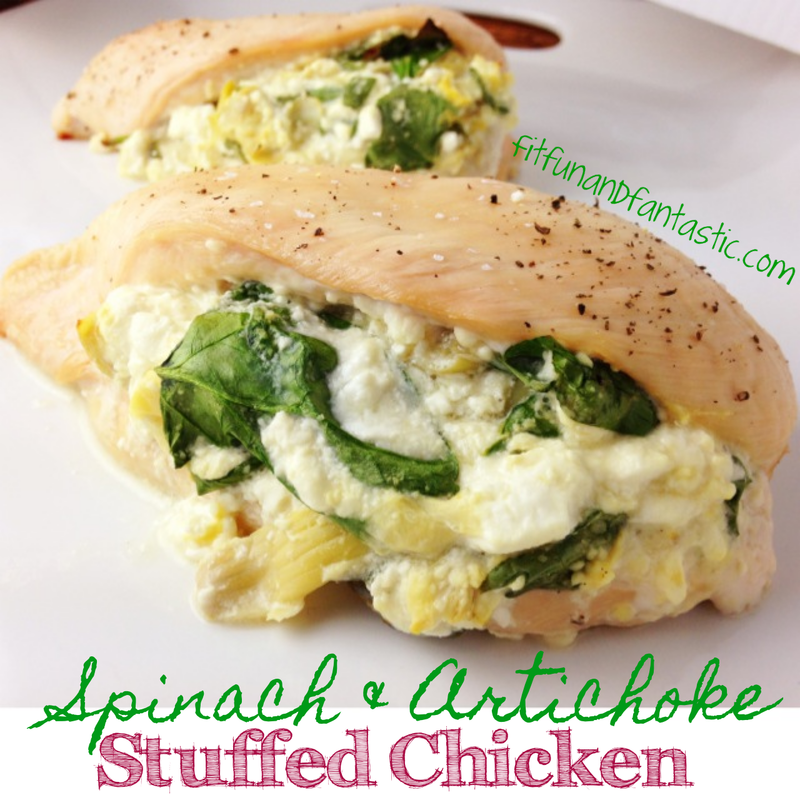 26 Responses to "Spinach Artichoke Stuffed Chicken"
Oh this looks great! What did you serve with it? Thanks! I served it with parsnip fries recipe is on my blog :). But, any veggie or mashed sweet potato would be great! I just found your blog and love it! Last night I made the spinach artichoke chicken and the pomegranite butternut squash quinoa, as a side, for my friends. It was a huge hit! Aw I am sooo glad to hear that! What is the purpose of the yeast? Could I skip using it? It gives a cheesy flavor without the cheese. Nutritional yeast has a lot of healthy benefits including that it is high in B12. You could always use regular cheese as well. what brand yeast do you use? the powder or flakes? You could try greek yogurt but it may be more tart. My husband who HATES cottage cheese even loves this! Maybe give it a try? You can use low fat ricotta. My son is lactose intolerant and for stuffed shell recipes we sub ricotta for Lactaid cottage cheese. You would never know the difference. So with that I say…don’t fear the curd – yo! I just made this today! Absolutely delicious and easy to make- I’m definitely no chef!! Thank you so much for sharing this For those of you who don’t like cottage cheese: I used feta cheese & it turned out great! Yay! I am so glad to hear it! I am making this for dinner tonight, getting lots of questions/concerns by my family members on to why this call for yeast??? Nutritional yeast adds a cheese flavor without cheese. I know the name isn’t very appealing but it tastes great! Plus, it is packed with nutrition, particularly B-vitamins, folic acid, selenium, zinc, and protein. It’s low in fat, gluten-free (check specific brands for certification), and contains no added sugars or preservatives. i use it for its flavor which is cheesy and nutty. The only substitution would be actual cheese, but then you are increasing calories and fat.